Clowns t-shirt design attempts to shed light on the troubling rise of Coulrophobia cases being reported. Coulrophobia is the abnormal fear of clowns. We don't see anything abnormal about fearing these horrendous creatures of evil at all though. In fact we designed this Clowns T-shirt to shed light on the problem and to let others know that they too should fear the maniacal circus freaks known as clowns. 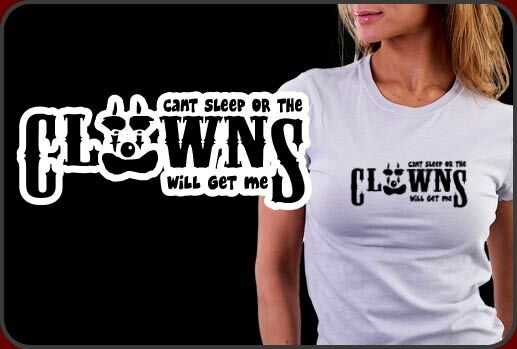 This is a hilarious t-shirt saying, Can't Sleep or the Clowns Will Get Me. Our Clowns T-shirt prints beautifully on any color t-shirt we have in our inventory too.